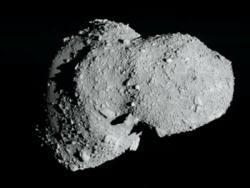 Japan's Hayabusa spacecraft last night ended its seven-year mission to asteroid Itokawa, burning up over the South Australian outback after releasing the sample return cannister, which survived the re-entry into Earth's atmosphere. Airborne Australian, Japanese and NASA boffins were on hand to capture the action from a specially equipped Douglas DC-8, and recorded the spectacular death of Hayabusa. The basketball-sized sample pod, protected by carbon heat shields, is the small dot on the right of the photo. Australian National University scientist Trevor Ireland, who caught the spectacle from the outback opal mining town of Coober Pedy, described the burn-up as resembling a meteor. He enthused: "It looked just like that in terms of fragmentation and pieces flying off it and glowing, it was just absolutely amazing." The pod parachuted down into the Woomera Prohibited Area and was located by its onboard radio beacon. Scientists will this morning recover it and seal it in an airtight container for return to Tokyo, where the Japanese space agency (JAXA) will find out if there's any Itokawa inside. That's by no means certain, since the Hayabusa mission was beset by technical problems. The spacecraft touched down on Itokawa (pictured) in November 2005 at a distance of 186 million miles (300 million km) from Earth. It was supposed to fire ball bearings into the surface and collect the resulting dust, although it's not clear whether that actually happened. Chemical thruster woes then almost consigned Hayabusa to a lonely deep-space death, until JAXA managed to use two functioning ion engines to get the craft back on track for a belated return to its planet of origin.